Killjoy physicists have long pointed out the sheer unlikelihood of building a working light saber. But now, they’ve taken a small step toward realizing the dream of Star Wars fans worldwide, by figuring out how to get photons to stick together like molecules in a super-chilled gas. This latest work builds on prior experiments from 2013, when Harvard physicists first announced a new state of matter. Photons don’t have mass and zip along at the speed of light, with no time to hang around in clumps. They also aren’t charged particles and thus don’t interact with each other much at all. They love to hang out with charged electrons, though. And that’s what’s going on here: the Harvard experiment created a special kind of medium in which photons act like charged particles with mass, enabling them to form molecules. This rule states that atoms neighboring an atom that’s been excited — say, by a passing photon — cannot be excited to the same degree as the initial atom. When multiple photons pass through a cloud of atoms, this creates a push-pull force between them, which is what binds the resultant molecule. Now, physicists at the National Institute of Standards and Technology (NIST) have shown that it’s possible to get two photons to travel side by side at a set distance from each other, similar to how hydrogen atoms are arranged in a hydrogen molecules. That’s an impressive degree of control that shows great promise for making molecular light. And if you can shape a molecule out of photons, why not a light saber? Before all you Star Wars fans out there get too excited, there are the usual caveats. There’s a pretty elaborate laboratory setup required to make even simple molecules of light, given the need for ultra cold rubidium gas. The photons can’t interact without it, and it’s quite the engineering challenge to shrink a roomful of equipment down to handheld size. Even if scientists figure out how to build complicated objects, like a sword, out of photons, there are plenty of other hurdles to overcome to make a working light saber — issues like power, size, and the difficulty of keeping the laser light within a short blade, since light won’t actually stop unless it hits something that can absorb or reflect its energy. 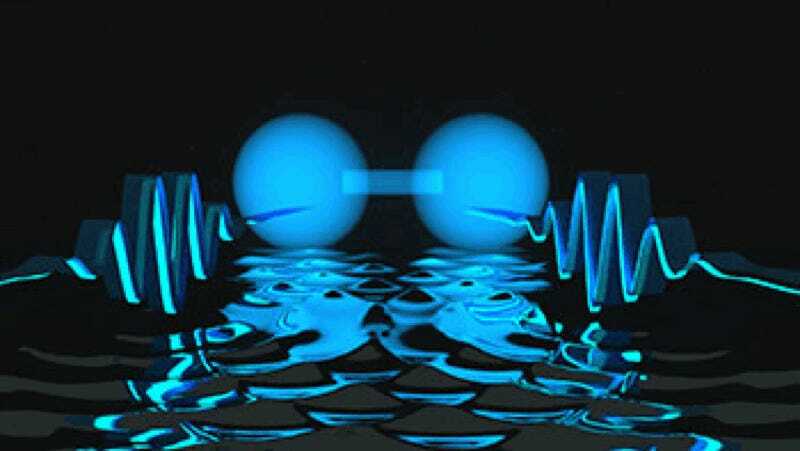 Image: Artist’s conception of two photons (depicted as waves) locked together at a short distance. Credit: E. Edwards/JQI. Firstenberg, Ofer et al. (2013) “Attractive photons in a quantum nonlinear medium,” Nature 502: 71-75. Maghrebi, M.F. et al. (2015) “Coulomb bound states of strongly interacting photons,” Physical Review Letters 115: 123601.